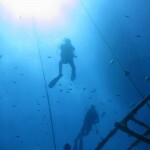 Pre- Requisite For Zenobia Dive: Advanced Open Water or Similar. 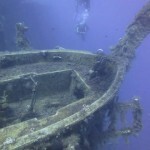 The First dive on this amazing wreck takes your breath away, seeing the wreck for the first time and the sheer size of the wreck and the lorries are awesome an to sight to see. 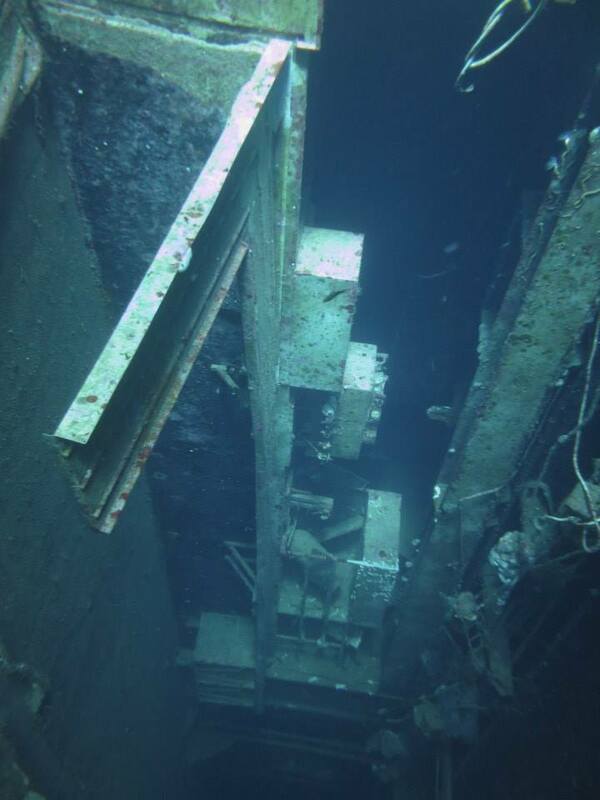 So having seen the Stern, propellers, back doors, the lorries and Lorry Deck on the first dive, what is left to see on the second dive you may ask? Well after coving the back section of the ship wreck on dive one, it,s now time to venture forward to the front section and the Bow of the ship. After we have done a 1.5 hour to 2 hour surface interval, it’s time to hit the water again. After completing our buddy check and a giant stride into the water, we make our way down the line to the side of the wreck. 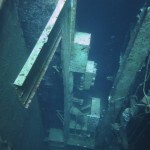 On our way down the shot line, you can see the several big windows of the canteen of which the first and the last windows have been removed so that we can enter the wreck. Dropping into the Zenobia through the last window of the Canteen is like going back in time. You can’t help imagining how it must have been for the passengers on the Zenobia on her Maiden voyage. As you enter the Canteen at the back, you can see the serving counter and also the tea and coffee machines where the drivers could get their refreshments for their journey. one from the film trainspotting! Looking through the Accommodation Block you can see signs of fatigue and parts of the Accommodation Block have started to drop, this section of the wreck is only a swim through for the more experienced diver. Turning towards the front of the canteen you can see what looks to be wall paper hanging from the wall but in fact it is not wall paper but is actually the carpet from the ship deck. Exiting the Canteen we can make our way to the Bow of the ship and out in front of us and slightly up to our right, is where the spare anchor is located . Once we have had a good look around the Bow of the ship and explored all the chains and winches that are located at the Bow, we turn and make our way towards the Bridge of the ship. The Bridge on the Zenobia has had all the windows and doors removed and this was to to make a nice easy swim through for divers. As we exit the Bridge of the ship, you can see the ship’s crane which now lays dormant. To the side of the crane is the entrance/exit to the lift shaft which leads down into the upper Lorry Deck of the ship. 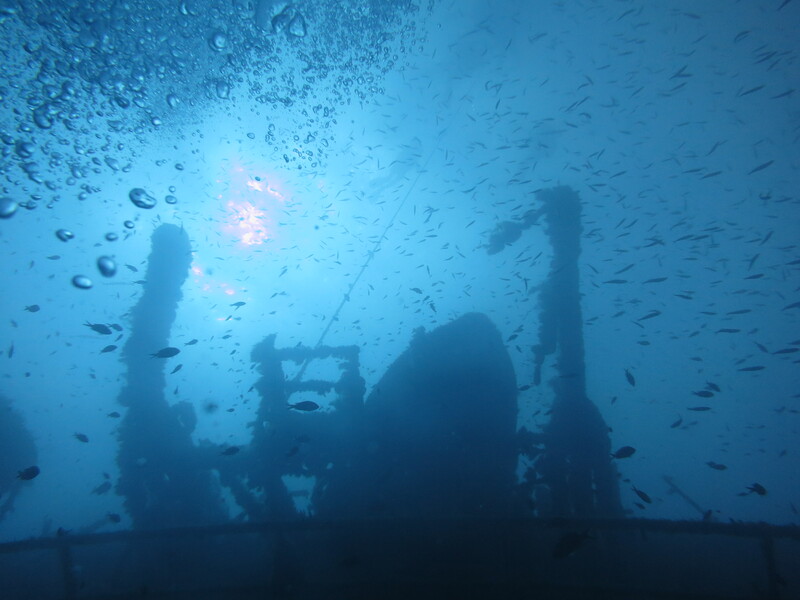 At this point in the dive, we carry on swimming towards the middle of the wreck where we turn and make our way up to the Life Boats and this is one of the most photographed parts of the ship. In this area around the Life Boats we have often seen schools of Barracuda and many times there have been over 100 Barracudas around the Life Boats or just out in the blue. We have also seen schools of large Amber Jacks out in the blue just beyond the Barracuda and it really is a fantastic part of the dive. Seeing all the sea life over the Life Boats and over the Bridge of the ship is an amazing sight. On the side of the wreck you can usually see smaller Groupers that like to come and say hello as they swim in with the other fish around this part of the Zenobia . At this point we are almost at the end of the dive but there is just enough time to have a look through the doorway that leads into the Lorry Deck. If you hold onto the side of the door, poking your head just inside and then close your eyes for a few seconds, once you open them again, you can see the massive opening that we looked into on the first dive. 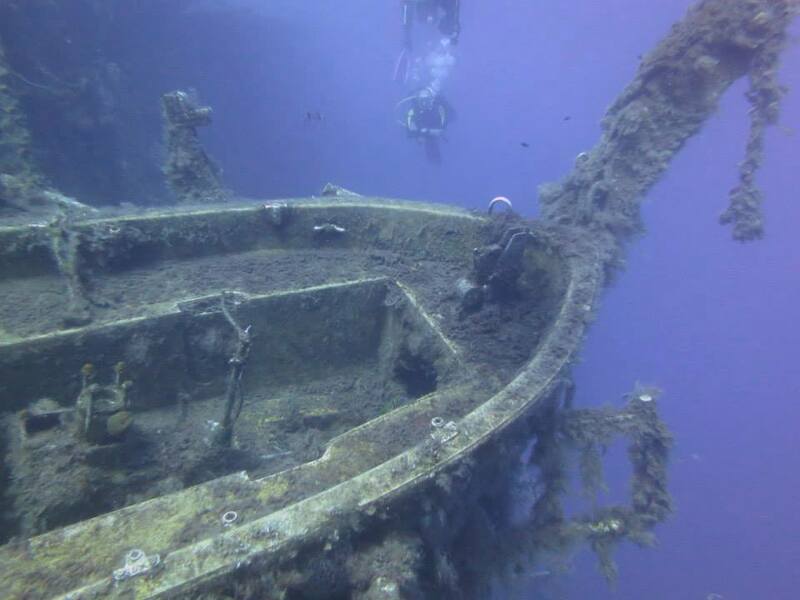 As we swim back towards the shot line when you look down, you can see the Starboard anchor on the side of the wreck. As we then make our way up to the safety stop keep your eyes open for Turtle and Jacks swimming around! Sometimes on the shot line we can see baby Trigger fish swimming around the markers too. Once our 3-4 minutes safety stop is complete we can make our way slowly to the surface and back onto the boat and all the time thinking of when will be our next dive on this fantastic wreck, as one trip is never enough to take in what this impressive wreck has to offer!. * When the Zenobia sank, she sank on her Port side. This means that everything is now on its side, so when we swim through the Canteen and the Bridge areas of the ship, take a few seconds to stop and just turn your head to see what she would look like if she was upright. 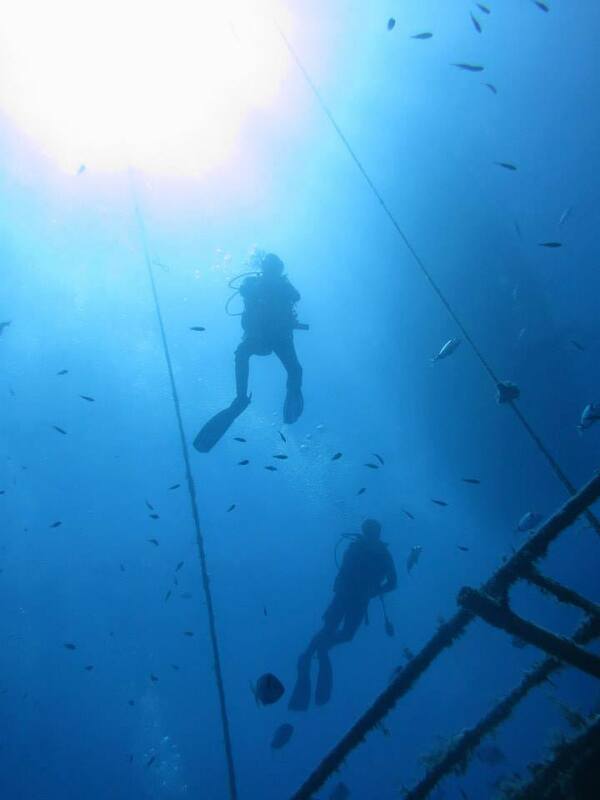 * When swimming over and around the Life Boats, keep an eye on the blue for the big Marine life. * On the side of the wreck is where the majority of fish will be so keep your eye out for Bream in there hundreds and the smaller Groupers. * The second dive on The Zenobia can be a bit choppy on the exit from the water, so take care as you always should when climbing the ladder on to the boat and when stowing your equipment.